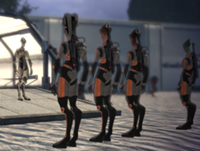 The Special Tasks Group (STG) is a salarian espionage organization, usually deployed by the Citadel Council. STG operators work in independent cells, performing dangerous missions such as counterterrorism, infiltration, reconnaissance, assassination, and sabotage. They are currently very active in the Terminus Systems. The STG form a large part of the salarian military due to their heavy focus on gathering intelligence before making a move. They are used to monitor "developing situations" because they tend to attract less attention than more prominent figures, such as Spectres. This also allows them to quietly "handle" troublesome individuals. STG operators are brutally practical, devoted to accomplishing their mission regardless of the cost involved to others or themselves. Regardless, STG operators are highly flexible, accustomed to carrying out their missions on shoestring resources and changing their tactics when necessary. STG operatives who showed exceptional skill were some of the first Spectre candidates. The records of STG missions are sealed and even the greatest agents are only known by codenames. These include the Ever Alert, who kept armies at bay with hidden facts; another, known as the Silent Step, was so successful he once defeated a nation with a single shot. However, the STG's role in tracking down the infamous League of One is common knowledge.